I have several pair of jeans that are perfectly good jeans, but just a size too large now. Not too big to wear, but certainly not as flattering as I'd like. So I decided to do something about it! By pinning a couple inches along the inseam and sewing as close to the existing seams as possible my new seams are practically invisible! Now my pants fit much better. By taking in the legs and crotch, they ride a little lower on my hips now, meaning the slightly too-big waist now fits at a wider part of my hips (though I still like to wear a belt for safety's sake). 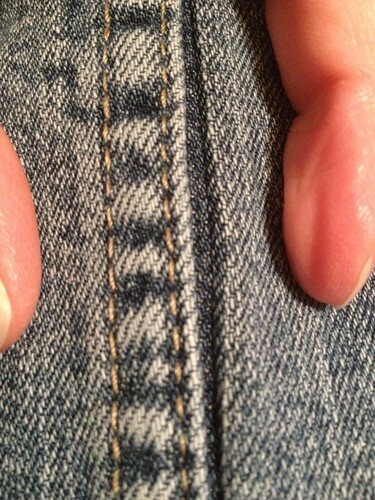 I even repeated this 5-minute redo on a few more pairs of jeans, and I love them again! Thanks so much for posting this! 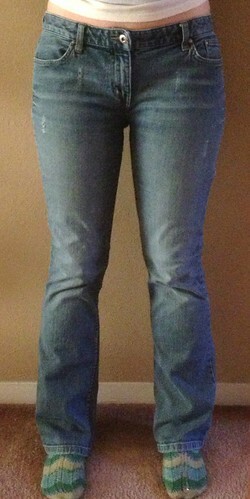 My hubs has lost a ton of weight and the new smaller jeans he got for Christmas are now all too big by one size. He's planning on staying at his current weight, so this will be perfect to salvage his new jeans! Those look lovely on you. Good refit. I did some a few months ago but didn't think to keep the existing seams. I just sewed new ones but they don't look as professional now, I don't think. Great job and it won't be noticeable. Very helpful alternative to removing the seam and trying to re-stitch through all those layers of denim. I have tons of jeans too big in my closet!! !